vintage | White Lies Knits! For our next installment of Double Duty Knits here on the blog, I am happy to present the Zelda pullover! The 40’s silhouette is shapely and girly; great to wear for casual or dressy occasions. In my mom’s day, if you knitted (which practically everyone did) then somewhere along the way you’d knit yourself a suit. At the time you might have done that on very tiny needles and it likely would have taken the better part of six months to complete. However, when finished you’d have a beautiful addition to your wardrobe and if you were careful with storing it you’d probably keep it for many, many years as she did and proudly show it off to anyone interested. I found it amazing that anyone could have the patience to do such an involved and seemingly endless project. Since I am so enamored of vintage fashions, I decided to give a nod to the days when knitters proudly wore their suits to any and every fancy or dressed up occasion. In these times when it is becoming increasingly popular to go out in public like this, it is a joy to see a woman taking enough pride in her appearance and talent to create and accessorize a beautiful outfit like the Retro Suit. 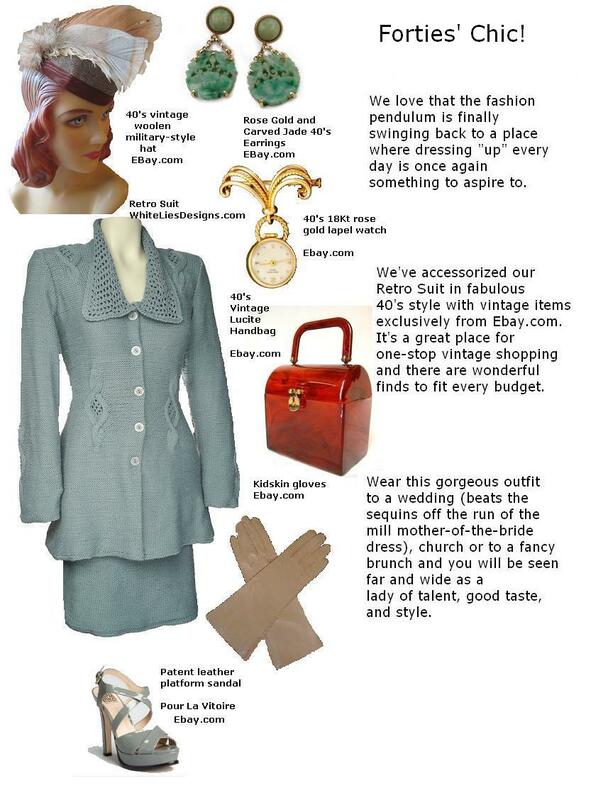 If you’re a real vintage afficionado, there is no better place than Ebay for a selection of vintage accessories, many of them quite affordable (the 40’s hat in my Styling Guide below went for a mere $24.99). 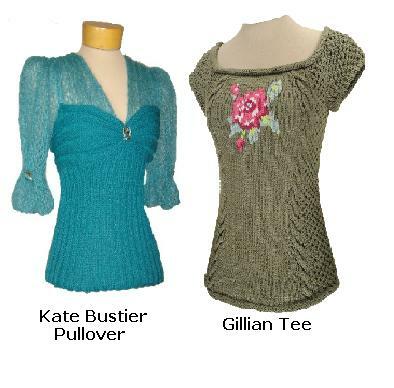 The book signing and shrug fitting event at Knitique last weekend was such a success, to further celebrate the wonderful book by Larissa Brown, “My Grandmother’s Knitting”, I’ll be giving a copy away to a lucky winner who signs up for my newsletter between now and March 15th. The book contains family stories and patterns from seventeen designers such as Jared Flood, Meg Swansen, Ysolda Teague and myself. 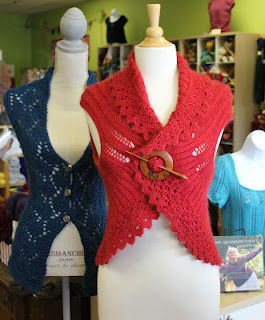 Here is Knitique’s photo of my Angelina Shrug named for my mother which is included in the book. Sign up for our White Lies Designs newsletter here for your chance to win a copy of this beautiful hardback book! 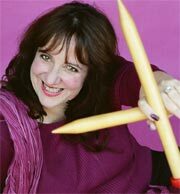 Many thanks to Lisette Davis for such a lovely photo. It’s been a while since we posted a new styling guide and today Clarissa is the lucky girl. My dad was a Navy man in WW2, so I have a soft spot for sailor pants on both guys and gals. 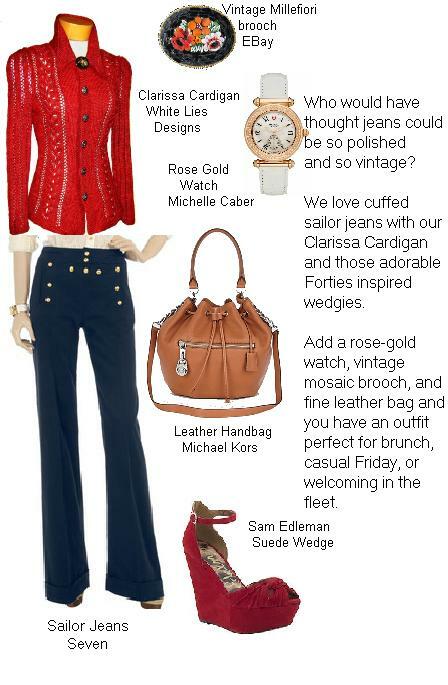 If a blue jean can be elegant then these certainly are, especially when paired with the lovely Clarissa cardigan and a gaggle of beautiful accessories. I must point out the Italian millefiori ceramic mosaic brooch worn at the neck of Clarissa; a vintage find on EBay. It’s amazing to find lovely folk art such as this for under $20.